What is a PLB or a Personal Locator Beacon? What is a PLB (Personal Locator Beacon)? A Personal Locator Beacon, or PLB, is a portable transmitter that sends out a personalized emergency distress signal to your nearest rescue services. If you are a hiker, camper, backpacker, kayaker, etc. and are simply out of cell phone range, a PLB is a highly effective and internationally recognized way to summon help. PLBs are emergency life saving devices to be used when all else fails! They should be used only if there is grave and imminent danger or a life-threatening situation. and the AFRCC ( Air Force Rescue Coordination Center) in the United States. The Global satellite tracking system is a collection of Russian, Canadian , American, and French satellites know as COSPAS-SARSAT , SARSAT being an English acronym for “Search And Rescue Satellite Aided Tracking”. The network is made up of 4 polar orbiting LEO (Low Earth Orbit) Satellites and 3 GOES (Geostationary Operational Environmental Satellites). Once a signal is received, these satellites can “fix” on the signal using a Doppler Shift location method (by "triangulation", which can take hours and can be accurate only to a half mile -Webmeister), or, when a PLB is hooked up to a GPS, the lat-lon coordinates can be Instantly transmitted without waiting (for the Doppler Shift triangulation from a second orbiting satellite --Robert Speik). The signal is then relayed to a LUT (Local User Terminal). This signal is then passed on to the Air Force to begin the Search and Rescue procedures. Each PLB is equipped with a UIN (Unique Identifying Number) This number is a 15 digit alpha-numeric code. This code is what is transmitted in the electronic burst to the satellites. The UIN is linked to a computer database. The electronic burst provides Search and Rescue with your location, while the UIN links to the database and provides your name, address, phone number and any pertinent information such as medical problems, of which Search and Rescue should be aware. When you buy a PLB, you must register it with NOAA. In doing so, they will tie all your personal information into the 15 digit UIN. That way, when your PLB is activated any where on the Planet, Search and Rescue will know, who you are, where you are and how to handle any pre-existing medical problems when they reach you. These two different signals are 406 MHz which, which carries the UIN# and GPS data to the satellites, and 121.5 MHz which is a homing frequency. If you are using a PLB without a GPS, the 406 MHz signal from the satellite will get rescuers to within a 2 mile radius of you. At the same time, SAR will be monitoring with a tracking device to home in on the 121.5 MHz frequency put out by the PLB. The average notification time to Search and Rescue with this type of PLB is 45 minutes in the continental U.S. If you are using a PLB with a GPS interface, the 406 MHz signal will guide rescuers to an area less than 100 meters from your position. At the same time, SAR will be monitoring with a tracking device to home in on the 121.5 MHz frequency put out by the PLB. The average notification time to Search and Rescue with this type of PLB is 5 minutes! In either situation, you can be found much quicker than any existing method (other than the SPOT-2 --Robert Speik). It is always a good idea to have a visual and audible distress signal such as a signal mirror (daytime) a signal whistle, or a strobe light (nighttime) to make sure that you are seen or heard easily, once Search and Rescue gets close. (A common inexpensive red LED bicycle blinker works up to 2 miles according to Rescuers). Why Hasn’t Anyone Every Heard of this Technology Before? The EPIRB technology has been in use for over 20 years in the marine environment in (Emergency Position Indicating Radio Beacons) and have saved over 15,000 lives. EPIRBs are basically PLBs that are specific for the Marine Environment. However, the EPIRB/PLB technology was not legal for use in land based applications until July 1, 2003. Governed by the FCC (Federal Communications Commission) it was not available because there was not a unified overseeing body for land-based rescues. In a marine environment, there is only one rescuing agency, the US Coast Guard, so coordinating rescues and responses has been a relatively easy task. Now, the FCC, NOAA and the US Air Force have combined to make the AFRCC (Air Force Rescue Coordination Center), the point of contact for land-based rescues. The AFRCC, in turn has established relationships and points of contact in each state. So, whenever a land based PLB is set off, the AFRCC will know exactly who to contact for a rescue response. How Long Will a PLB Transmit? A PLB is equipped with a Lithium battery that has an 11-year life span. It lies dormant until you flip the switch to activate the PLB, (calling 911). Since the functionality of a battery is negatively affected by cold, this operational tolerance, is a worst case scenario. If the average temperature is 70° F, the battery will be able to operate for approximately twice as long. Is There a Monthly Subscription Fee for this Product? There is no fee. The satellites are already in orbit and so is Search and Rescue. Buy a PLB from Mountain Gear! 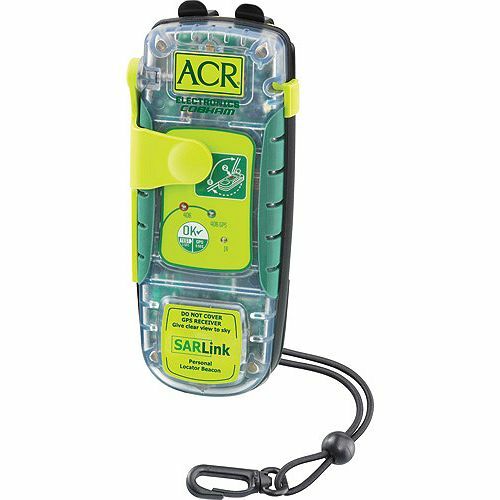 Head out into the backcountry with confidence and with the SARLink GPS Personal Locator Beacon from ACR Electronics that assures you if an everyday accident becomes a life-threatening situation you are prepared. With a powerful 406 MHz signal and 121.5 MHz homing capability, the SARLink quickly and accurately relays your position to a worldwide network of search and rescue satellites - reducing search time and increasing your chances of survival. 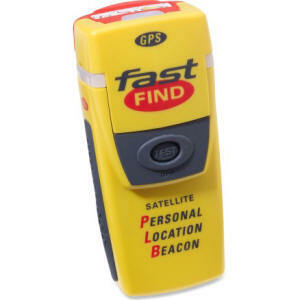 The smallest, lightest PLB on the market, the affordable McMurdo Fast Find 210 Personal Locator Beacon with GPS provides true global coverage to find you quickly, even in the most remote of locations. This Personal Locator Beacon should only be used in situations of grave and imminent danger, and only as a last resort when all means of self-rescue have been exhausted. COSPAS-SARSAT is an international satellite system that provides distress alert and location data to assist Search and Rescue operations. It detects and locates the signals of beacons operating on 406MHz. The position of the distress and other related information is forwarded to the appropriate Search and Rescue point of contact through the COSPAS-SARSAT mission control center network. The goal of the system is to support all organizations in the world with responsibility for SAR operations, whether at sea, in the air or on land. The COSPAS-SARSAT system provides distress alert and location data to rescue coordination centers for 406MHz beacons activated anywhere in the world. Webmeisters note: The SPOT (GPS based satellite telephone/text communication device) led a revolution in size and weight over the last couple of years! Your map, compass and GPS and the ability to use them plus your cell phone are the practical substitute for the PLB. Every airplane has a Locator Beacon on board. Almost every off shore boater carries an EPIRB on the vessel, so the concept is not revolutionary. The price, weight and inability to test the functionality of the PLB will likely deter the typical recreational user. The SPOT Satellite Messenger may replace the PLB. We note that the SPOT-2 can be checked unlimited times for connect ability to your home and friends, and if that works, so will your official emergency call to 911. This communication technology will save the lives of adventurous souls beyond the cell phone net, but will it detract from the adventure? Risk is part of traditional alpine mountaineering. But is the adventure worth the Risk? Bulletin Reporter James Sinks broke the news that House Bill 2509 might require “mountain climbers” and guides to carry an electronic beacon when they venture above the tree line on Mt. Hood. A controversy erupted between experienced mountaineers and those who would reduce government costs by controlling irresponsible thrill seekers asking for expensive search and rescue efforts while endangering volunteers. According to an Oregon State report climbing accounts for 3.4% of rescues, mushroom picking 3.0%, hiking 13.8%, vehicle, ATVs, snowmobiles 20.5%. Enough said. Lawmakers recalled the 1986 Episcopal School Tragedy where seven teens and two adults died in an unmarked snow cave while for days searchers combed the broad snow slopes of Mt. Hood. The leaders had made many common sense basic mountaineering errors. This tragedy led to the invention of the electronic Mountain Locator Unit (MLU). For ten days in December last year, the world’s media focused on the plight of three experienced mountain climbers missing in a storm near the summit of Mt. Hood. Two of the three north face winter ice climbers may have fallen, stranding Kelly James. He called his home in Texas using his cell phone, triggering the rescue effort. Days later, when the weather cleared, searchers quickly found Kelly who had died from hypothermia shortly after his one phone call. Kelly did not call 911 for rescue. In February, eight adventurers challenged Mt. Hood by climbing north up the snow slope from the parking lot to Illumination Saddle to camp in two snow caves. The next morning, while descending the easy slopes in a forecast snowstorm, three became separated from their five companions. Very poor navigation had led them 90 degrees east to a steeper snow slope. Three slid down uncontrolled, abandoned two of their backpacks and then hiked for forty minutes until forced to spend the night ill equipped and un-prepared. They called for rescue. Searchers found them next morning, inexcusably wet, cold, hungry and thirsty. The group committed a comedy of mountaineering errors. Note that they called rescuers every hour by cell phone. None of the three had their personal GPS to report their exact position or to find the nearby parking lot. However, searchers easily figured out where they were from their phoned information. By chance, one of the two rented MLUs among the eight climbers was with the group of three. Portland Mountain Rescue (PMR) used the Mountain Locator Unit system. Searchers commented that the MLU was “hard to use and not very precise”. PMR advocates the use of electronic communications with GPS receivers but does not believe the State should require anyone to use “electronic signaling devices”. The following is my observation, speaking from the experience of a traditionally trained mountaineer. First, a rescue does not begin until a Responsible Person calls 911 if the adventurer does not return by an agreed time. Second, when a person becomes stranded due to illness or injury to themselves or others, or if they become lost, or are forced to overnight or shelter from a storm, it may be better to phone for help then, rather than waiting for the Responsible Person to call 911 hours or days later. Experience tells me to have this option. MLUs: Mt. Hood Mountain Locator Units are simple radio transmitters. They are managed by Clackamas County Sheriff’s Office, which is liable for maintenance, battery replacement, rental and user instruction. Note that MLUs require a separate radio or phone call to 911 before any search begins. They are only available on Mt. Hood. SATs: A third option is a Satellite Cell Phone. These units work like a PLB, but you can verbally send your GPS coordinates and chat. They are heavy, expensive and require a monthly subscription. Walkie-talkie radios are a low cost option, but someone must be listening. Best option: Your own everyday Cell Phone and your simple GPS. A good cell phone is FREE with a $20 per month, two-year subscription including 200 free monthly minutes. One can call for help and give their very accurate GPS coordinates. My friends choose to bring their own cell phones, GPS receivers, base plate compasses, USGS topo maps, and the knowledge of how to use them together. The cost of a quality map, compass and GPS is $136. Additionally, the Mountain Rescue Association, which represents over 90 mountain rescue teams through out North America, opposes HB 2509. The Mt Hood Search and Rescue Council, which represents all the agencies and resource groups on Mt Hood, opposes HB 2509. Oregon Mountain Rescue Council, the organization recognized by the Oregon State Sheriffs Association as the accreditation body for mountain rescue teams in Oregon, opposes HB2509. The Mazamas, a non-profit mountaineering education organization representing over 3000 climbers, opposes HB2509. We believe a law requiring climbers to carry electronic devices will have unintended consequences that will increase the risk to both climbers and rescuers. Additionally, when the state mandates specific equipment it gives the climber a false sense of security. The climber will be more likely to take greater risks because they believe that since the state has required a “beacon” they are entitled to a rescue. For example, in February, the eight climbers lost on Mt. Hood had beacons, GPS and a compass. When rescuers got to them they walked out on their own. The media portrayed this as great example of the value of the MLU. Our analysis leads us to conclude that they were relying on the rescuers to save them when the incident could have been completely avoided had the climbers known how to properly use their compass and GPS. Self reliance in the mountains is essential for survival, HB2509 will not cause climbers to be more self-reliant. In fact we believe that this law will lead to more reliance on the rescuers. House Bill 2509 was conceived by a representative as an emotional response to the families of the lost climbers on Mt. Hood. While these people have good intentions, they do not understand issues involving climbers and rescuers on Mt. Hood. The mountain rescue community is in the best position to understand these issues and help craft effective solutions. We are already actively working on solutions in conjunction with the Governor’s Search and Rescue Task Force and we welcome all opportunities to keep Oregon a wonderful and safe place to enjoy our mountains. A vote in favor of this bill will be against the advice of the entire mountain rescue community in this state and in the nation. Portland Mountain Rescue’s (PMR) mission is to save lives through rescue and mountain safety education. For the past 30 years, PMR has been readily available to search for lost backcountry travelers, assist injured climbers, and provide other ‘safety-net’ services for outdoor enthusiasts who have made a miscalculation about mountain conditions or had an accident. Recent rescue missions have attracted national headlines and inspired some members of the Oregon State Legislature to sponsor House Bill 2509 that would require climbers, on Mount Hood, to carry a two-way device (cell-phone or walkie-talkie) and a Mountain Locator Unit (MLU) / Personal Locator Beacon (PLB) if climbing over 10,000 feet. House Bill 2509 has generated much discussion in the mountaineering and mountain rescue communities alike. Many of these organizations believe that the focus of the legislation is somewhat misguided. Safe mountaineering requires skill, planning, humility and common sense; and many feel that requiring the use of MLUs/PLBs will diminish the value for learning the skills required to travel safely in the backcountry or above timberline. PMR agrees that MLUs/PLBs can make it easier to locate lost individuals in some situations and we would prefer that more parties carry them. However, we believe the emphasis should be on the front-end of a climber’s experience in the outdoors: education. As part of that education process an aspiring climber should become familiar with the use of a map and compass, global positioning systems (GPS), MLU/PLB, a cell-phone or other devices that could assist in finding one’s location. 1. Devalues safety education – By providing climbers with a false sense of security we have devalued the motivation to develop the proper safe traveling skills and planning for unexpected situations, thus leading to more rescues. 2. More danger for rescuers - It will place volunteer rescuers in more danger by fostering an unrealistic expectation that carrying government-mandated equipment entitles climbers to rescue regardless of unsafe conditions. 3. Delayed rescue calls – Search and rescue experts indicate that if penalties exist for stranded or injured climbers, who do not carry an MLU/PLB, they often delay calling. This results in further danger for the stranded or injured party and the rescuers alike. PMR believes the emphasis should be on education that MLUs/PLBs are available for climbers to use, along with other navigational devices, instead of misguiding the public by mandating those devices as the “silver bullet” to address an undefined problem. (March 21, 2007) — The Mountain Rescue Association urges the Oregon State Legislature to postpone indefinitely House Bill (HB) 2509, which requires mountaineers to carry specific electronic equipment. 2. should include detailed planning meetings with the backcountry user group as well as the mountain rescue community. The Mountain Rescue Association feels that Oregon’s HB 2509 has been neither deliberate nor included such important meetings, particularly with the rescue community that serves Mt. Hood. State and Federal lawmakers do have a duty to respond to public calls for action, but they also have a duty to the emergency medical service providers in the community. While Oregon’s HB 2509 responds to a public call for action, its path through the Oregon General Assembly appears to not include detailed planning meetings with the mountain rescue community or the mountain climbing community. While HB 2509 has public support, the public appears to be unaware of the dangerous unintended consequences that this legislation may create – consequences that could actually increase the number of rescue operations, thereby putting the rescue community in greater risk. Under Oregon law, individuals can be fined for reckless behavior that results in search and/or rescue operations. Ironically, Oregon’s HB 2509 could actually increase the number of search and rescue operations on Mt. Hood. The Mountain Rescue Association (MRA) is "a volunteer organization dedicated to saving lives through rescue and mountain safety education." The MRA, established in 1958 at Timberline Lodge at Mount Hood, Oregon, is the oldest Search and Rescue association in the United States. With over 90 government authorized units in the US, Canada and other countries, the MRA has grown to become the critical mountain search and rescue resource in the United States. The large majority of our membership is made up of unpaid professional volunteers who have been fully accredited in Mountain Search and Rescue operations. HB2509 was approved by the Oregon House and sent to the Senate! The Oregon House has approved a bill requiring climbers to carry beam-emitting electronic locator devices when they head for the summit of Oregon's tallest peak. Legislators are hoping to cut down on climbing disasters on Mount Hood. The measure now goes to the Senate. It was introduced mainly in response to last December's climbing disaster. Three out-of-state men perished after they got caught in a blizzard near the summit of Mount Hood. Mountaineering groups oppose the bill. They say requiring ALL climbers to carry the locators would infringe on their freedom to pursue the sport without government interference. The bill was endorsed today by a 33-22 vote. The legislation got an unexpected boost last month. Three climbers trapped on the mountain overnight were rescued after they activated a mountain locator unit that led searchers directly to them. How do Personal Locator Beacons PLBs work?